‘Laughing Matters’ – The library hosted a series of free-standup workshops for young people aged 15 to 19 in partnership with the Cardiff Comedy Festival.The workshops were facilitated by comedians from the Festival who taught the participants storytelling and theatrical techniques, how to analyse the stand-up skills of famous comedians. The workshops culminated in a live show at the library, where the young people performed their very first stand-up gig. ‘Vibe: One City, Many Cultures’ – An event that took place in the Community Languages section of the library, organised to celebrate the many cultures that make up the capital city. The different events included cooking demonstrations, various dance and music performances, poetry recitals, henna tattoos, and hair braiding. Poems and Pints – In partnership with Academi and real ale campaigners CAMRA, this was a prequel event to the city’s BayLit Festival. The library hosted an evening of poetry performances from some of Cardiff’s most exciting and engaging poetic talent, hosted by renowned poet and actor Thaer Al-Shayei. Alongside the poetry was a bar serving real ales and ciders for thirsty poetry fans. 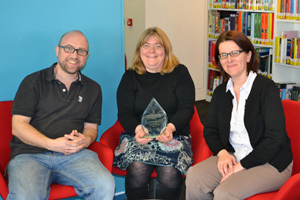 Cardiff Central Library were awarded First Place out of the Public Libraries in the competition.